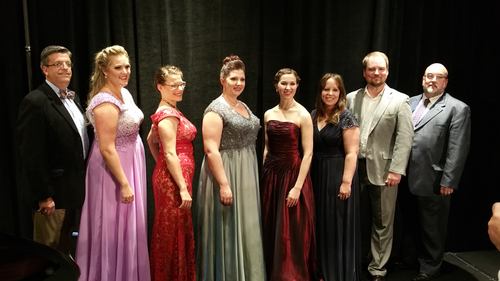 CHICAGO – Outstanding performances were the order of the night at the 44th NATS Artist Awards competition finals on Friday night, but soprano Rachel Schutz dominated the stage and won first place, earning more than $13,000 in cash and prizes. The NATSAA finals were part of the first full day of the NATS 54th National Conference at Chicago’s Marriott Magnificent Mile hotel. A group of 14 singers were trimmed to a final group of six during Thursday night’s semifinal round. Baritone Thomas Gunther finished second, while soprano Mathilda Edge won the Irma Cooper Award for third place. 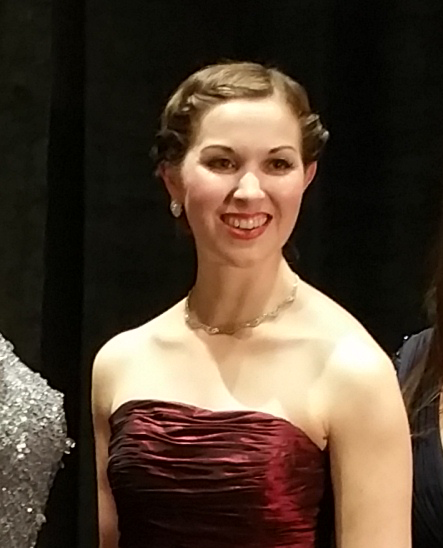 Soprano Heather Hawk won the Berton Coffin Award for fourth place, Rebecca Sacks the Herald Stark Award for fifth place and Bridget Moriarty was awarded the Mary Wolfman Award for sixth place. Schutz won $5,000 cash, a New York solo debut in a major choral work with orchestra and chorus sponsored by DCINY; a $4,000 Scholarship to attend the American Institute of Musical Studies (AIMS) in Graz, Austria; a $1,000 gift certificate from Hal Leonard Corporation; and a solo recital at the next NATS National Conference. Schutz is a current student of Randall Scarlata and previously studied with Judith Haddon. Gunther won more than $6,000 in cash and prizes: $4,000 cash plus a $2,000 scholarship to attend AIMS in Graz and a $500 gift certificate from Hal Leonard Corporation. Gunther also won the Kirsten/Browning Award for Most Potential, worth an additional $1,500. Schutz and pianist Jonathan Korth performed four pieces: Anne Boleyn (Try Me, Good King); Davno-l’, moj drug, Op. 4, No. 6; Hark the echoing air (The Fairy Queen); and Non, Monsieur mon Mari (Les mamelles de Tirasias). Sponsors of this year's event include Distinguished Concerts International New York (DCINY), AIMS in Graz, the Hal Leonard Corporation, and the NATS Foundation.